Ask fellow campers about "Bayou Wilderness RV Resort" and nearby attractions. The roads leading to this RV park are a bit rough and it's somewhat far from the freeway if you're looking for an overnight stay. Very quiet RV park in a rural area. Our site was very nice. Long gravel pull-thru site with cement patio. Picnic table, BBQ. FHU-50 amp, cable, excellent Tengo wifi. Pool. Lots of space between sites. Some sites were on grass and had no patios. Internal road were OK...not great for big rigs, but OK. Looked like there are some long-time residents. Check-in staff was excellent. Small store, which was helpful as there is not much around this location. We camped at Bayou Wilderness RV Resort in a Fifth Wheel. Very friendly staff and owners. Very helpful with RV set up. Road to this aren't the best but well worth the trip. No problems with maneuvering 43 ft coach and tow just need go slow and use caution. Nice serine gated community. Will return when traveling thru bayou country! Don't follow GPS when coming in from north 59. Use #2 exit 49 southbound! We camped at Bayou Wilderness RV Resort in a Motorhome. The roads getting in to this place are horrible. The staff at sign in were amazing and seemed to love this area. Gravel roads were easy to navigate but not wide enough for us to turn into our site without killing grass. The gravel pad was barely wide enough for our rig. It had been raining a lot prior to our arrival so there was standing water everywhere. Utilities work good, good water pressure, good at&t and verizon signal, wifi poor. They may feel that they are big rig friendly but I would not agree. This is not a resort either. Very quiet at night. They also have a huge field where they allow off leash activities with your furry kids. We camped at Bayou Wilderness RV Resort in a Fifth Wheel. Stayed two nights. Staff friendly. Site was good, level. Grass and gravel. No picnic table. Water pressure good. WiFi good. Cable good. Roads are gravel. Road out of the park fraught with potholes. We camped at Bayou Wilderness RV Resort in a Motorhome. Easy on/off from I-49. Don't try from I-10. There were quite a few potholes on our way out of the campground, but manageable. Jnternet was per usual - weak. Cable excellent. Beautiful setting. 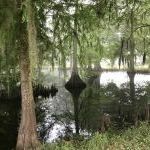 Site 55 was overlooking a "pond" with cypress trees. It was possible to walk around the pond. Within 15 minutes of Lafayette. We camped at Bayou Wilderness RV Resort in a Motorhome. Don't miss Bon Temp Grill. The Shrimp and Grits were to die for. After talking about "heat", and after I committed to getting it, our waitress got the cook to let me try the sauce to see if was too hot for me. It was perfect. The meatloaf was spicier than my companion expected, but she said it was very good. The Cathedral was definitely worth seeing. Friendly staff, level graveled sites. Good internet. Long pull throughs. Very satisfied with this park. Cable hookups. We camped at Bayou Wilderness RV Resort in a Motorhome. Nicely landscaped with plenty of room between sites. Easy to get into the sites. Everything works exactly as promised and the owners are exceptionally nice. The park is gated and the owners are on premises. We would come back again. We camped at Bayou Wilderness RV Resort in a Motorhome. Great RV park! Quiet and clean and everyone we met was extremely friendly. Owner went above and beyond to accommodate our needs. Great Christian owners who treat people with respect and honesty. 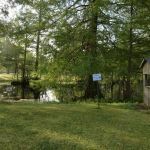 Grounds are very spacious for walking your pet with an awesome Acadiana pond complete with beautiful cypress trees. 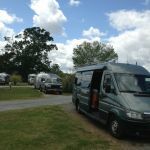 We would definitely stay here again and recommend it to anyone looking for a campsite in the Acadiana area. We camped at Bayou Wilderness RV Resort in a Fifth Wheel. Very quiet, well maintained RV park. Spaces are gravel and very level. Restrooms and laundry facility are clean. Owner and staff are extremely friendly and very willing to answer any question about the area. Received excellent recommendations to local restaurants. We camped at Bayou Wilderness RV Resort in a Motorhome. Must take the Tobasco factory tour. Visit Duffy's Diner for lunch. Nice quiet park with store and fishing pond. Although the park seemed to be mostly permanent residents. We camped at Bayou Wilderness RV Resort in a Travel Trailer. We stayed at this park in 2014 and it was maintained lots better then. The paved roads were full of potholes and the gravel was almost nonexistent. There was no cap on our sewer. The site was not level. Laundry and bath/showers were air conditioned. Driving to the park gave you a feeling of being in the bayou wilderness. The staff was friendly. We camped at Bayou Wilderness RV Resort in a Travel Trailer. Choose your site carefully if there has been a heavy rain. Our site was under about four inches of water when we checked in. Our shoes were soaked by the time we set up and leveled. Secluded remote location. Poor local access roads. Gravel uneven interior roads. Power went out in park for 3 hours but was ok after that. Not level sites and old hookups. Cable TV reception was poor. Pretty Lake with well manicured grass. Very quiet. Would not stay here again. Motorhome 36' We camped at Bayou Wilderness RV Resort in a Motorhome. I have traveled coast to coast with my job. Stayed in camper trailers since April 2001. This is by far the best park I have ever stayed in. They have a small store with very courteous people. The grounds are manicured. Everything about this place is perfect. The first place my wife has said that she wants to come back to. All sites are pull through .thumbs up. I wish I had more hands for more thumbs up I have a 43 ft toy-hauler and I have room. We camped at Bayou Wilderness RV Resort in a Fifth Wheel. Upon arrival, staff is very friendly and prepared to make your stay a relaxing time. Park is clean with pull-through level sites. Will definitely stay again. We camped at Bayou Wilderness RV Resort in a Fifth Wheel. Large park, only grass & gravel even for the long term. No picnic benches. Fairly close together. Nothing special and it's way off the road. We camped at Bayou Wilderness RV Resort in a Motorhome. Only close to Alexandria for food. Jockey lot is near by along with several great places to eat. Are you affiliated with Bayou Wilderness RV Resort ?